A few nights ago at Spints Alehouse I noticed that they had a 33 cl bottle of Leipziger Gose from Bayerischer Bahnhof on the menu. I've been trying the Portland-brewed Goses from Upright and Cascade -- actually, all of them at once at Brewpublic's Gose Solstice celebration in December -- but had never tried a German one. Bottles of the Bayerischer seemed to elude me, so I was excited that Spints had them. It was quite nice, thirst-quenching and appetizing. The slight tartness was balanced by the very slight saltiness, and the coriander enhanced the faintly herbal flavor. Upright and the lighter Cascade versions mimic this one pretty closely, though of course Upright's farmhouse yeast contributes its own herbal notes. The story behind this beer is fascinating. Originally brewed in the German town of Goslar -- a UNESCO World Heritage Site and an interesting place to visit, by the way -- the style really caught on in Leipzig before dying out in the 20th century. The salt in the recipe is apparently there to mimic the taste of the water from Goslar's wells. 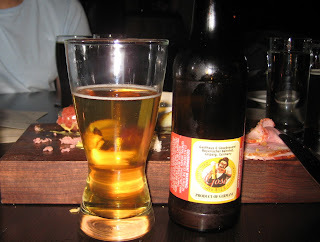 Angelo has a really nice post about the history of the style and the local Goses. More background from Jeff here. And here's a very comprehensive article by Ron Pattinson. Originally this post was going to be about last night's Fort George meet-the-brewer at the Green Dragon, except that three other bloggers beat me to the punch and wrote it up better than I would have. But there is a tie-in to this article, because Fort George's Oyster Stout -- called Murky Pearl -- was one of the attractions last night. Oyster Stouts are another style that was dead or dying, but is making a comeback. The two I've had, Fort George's and Upright's -- gee Alex, what style can you resurrect next month? -- are not noticeably fishy at all. At most, there's a slightly briny aftertaste. They're both worth seeking out; I give a slight edge to Upright's, which will be out in bottles next week. 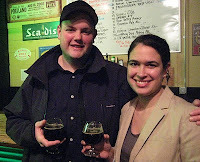 For more background, read Ezra's excellent article about Oyster Stouts. The picture here is of Fort George brewer Chris Nemlowill and his wife Zetty McKay. Zetty is the Coffee Girl that Chris named Coffee Girl Stout after. Any other ones that you can think of? Comparative review I did last year. On your final question, I would say that Adam is at the very most a long-lost style, and that HotD's version is a unique style inspired by the legend. Adambier is lost to the time. I'm not sure oyster stouts were ever actually lost. Like oatmeal stouts, they were on life support, but I think were still brewed in England at the great beer nadir of the 1970s. Last night I saw a Norweigan sahti at Belmont Station. That style was mostly lost, too. Kvass? I wouldnt say Oyster Stouts were ever quite lost but certainly to most drinkers never 'found' so close enough. Also Sahti is a good suggestion since Dogfish Head just brewed one. Berliner-Weiss might count as a style brought back, but never lost in Germany so maybe not. Jeff: point taken about Adambier. Is it a similar stretch to say that today's Gose is the same as the historic one? Sahti and Kvass may have fallen out of commercial production, but people kept making both at home. I wouldn't say they ever died. Ezra, I got the idea from your Oyster Stout piece that no one brewed a stout with oysters after the 1960s. Did someone keep doing it? Gruit is a contender. Is it uniform enough of a style? How about Anchor's Small beer? yeah I did not think I suggested they were not brewed any longer. There are breweries in Scotland, England and New Zealand that have continuously produced them. In America I dont think anyone has been making them regularly but many have experimented with them and Magnolia in SF has been making it annually and even 21st Ammendment atleast the last few years. El.Hueso: that's interesting, not so much a style as a kind of a technique that fell out of practice. Along those lines, how about steinbier? Maybe that's what gruit is also, more of a technique than a particular style? Braggot? Did that fall out of use and then return? How about a British Mild, Stein Bier, Stark Lager, Eisenbock, Roggen, Vienna, Dunkel, Belgian Dubbel, Belgian Enkel, Belgian Scotch or Scottish export? Seems like there are plenty of lost and non-lost styles to be re-introduced. Good work, Moby! I already mentioned Stein Bier. I'll add Roggen. As far as I can tell, the rest never went out of production, maybe just declined in popularity?